Welp. I tried to think of all the things I could say about this session and this amazing woman...but I kept coming up speechless. Truth is, as soon as I set my eyes on this girl, I KNEW that I had to photograph her. That's probably why she's a professional model + actress. Her look is absolutely mesmerizing. Ari Dean robe from Underwear of Austin. What's more than that, though (I know what you're thinking...can there be MORE!? ), is her glowing personality! It was truly a pleasure to have this stunner in front of my camera! And that was just one outfit, guys. Her first look of the shoot! Yes, Lola is a legit pro. But I never stopped viewing her as a CLIENT. Not as a model. Apparently that paid off, because Lola texted me after I sent her a few sneak peeks saying that she doesn't have ANY photos like the sneak peeks, and that they were truly "HER" and not "her playing model". I cannot tell you how fast my heart exploded after hearing that! My ultimate goal it to make everyone feel beautiful AND like THEMSELVES...just a little sexier! ;) THANK YOU THANK YOU to Lola for gracing my studio with her presence this weekend. Cheers to many more! I certainly cannot take sole credit for this awesome shoot! We had an AMAZING team of fabulousness! Seriously. Y'all. I had one of the most fun photo shoots of my career last week...which is a pretty bold statement to make, because all of my shoots are the "funnest". Before. Still cute as a button. Such a classic beauty, this one! She was so natural and effortless in front of my lens. I cannot WAIT to share Part II with you tomorrow! It's insanely insane in awesomeness. Be prepared. THANK YOU THANK YOU THANK YOU to Kendall of Mayhem Beauty for rocking out Miss "O"s hair and makeup for this shoot, and for UNDERWEAR for the beautiful wardrobe. Va Va Voom. Want to be in front of my lens? Let's chat dahhling! This weekend, another one of my beautiful "repeats"-- I love these people--, Harlee shot with me in the deep, dark, mysterious woods (just kidding, we were in a small patch of tangly trees next to a parking lot) for a dark beauty concept shoot this weekend. She kind of looks like a glamorous super villian, right!? Pretty pretty pretty girl! It was so fun trying something a little different from my usual bright and cheery imagery and going a little moodier. Harlee rocked the dark beauty role!!! Go girl! 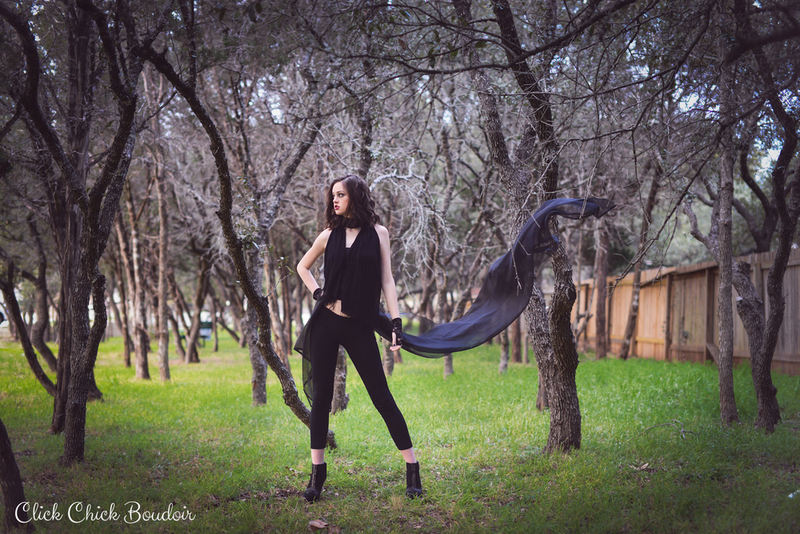 For more information on Austin beauty and boudoir photography, visit the Click Chick Boudoir website. Want to book a beauty or boudoir shoot? Let's chat, dahhling! Subscribe to get the occasional beauty and boudoir goodness via email!